Idyllic memories of childhood pre WW1 are recounted through the night by an under age soldier in France as he waits for the hour of death to come at 6AM. 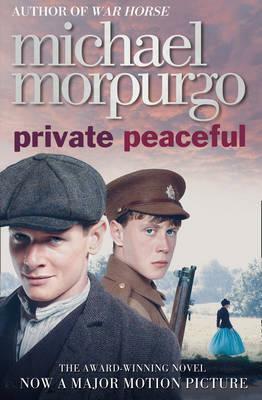 To begin with you are not sure exactly where Tommo Peaceful is, as he lies there recalling his father’s death, his mother, his brothers Charlie and Big Joe, the love of his life Molly who has married Charlie and their schooldays and working life together before they joined up and were shipped off to fight. After a few chapters you realise he is at the front, and for a short time you assume it is his death which is approaching perhaps anticipating some big push over the barricades. But, no, it is the brother’s. One brother paying the ultimate price for staying with the other. The carnage of the trenches and the horrors of the gas provide the ultimate contrast to his memories of country life. Ultimately, this is a book about brotherly love, about doing what is right irrespective of the consequences – with a nice touch across the lines when the German soldier spares Peaceful’s life. This book will grab you from the first chapter “Five Past Ten” all the way through to its last “One Minute to Six” and provide a night to remember. ashramblings verdict 5* quite simply a great book, deeply moving and poignant.